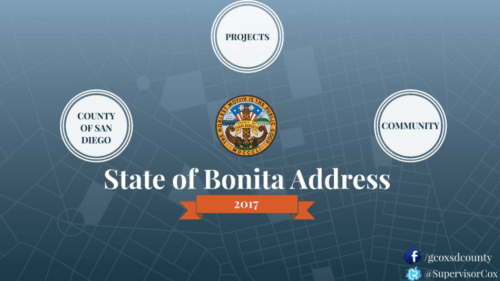 The 2017 State of Bonita Address was given by Supervisor Greg Cox on August 2nd at the Bonita Library Community Room. This meeting addressed regional concerns and helped inform members about community news. Important meeting highlights included the county budget, various road maintenance projects and construction projects (including Bonita-Sunnyside Branch Library expansion) and much more. Thank you to Supervisor Greg Cox and everyone who attended. Click the button below to view full presentation.